Designed to handle hot melt adhesives and sealants of all viscosities and abrasiveness, the Therm-O-Flow® hot melt systems from Graco and Kirkco outperform the competition time after time. They easily integrate into any system, require little maintenance and are one of the most durable bulk hot melt drum unloaders on the market. 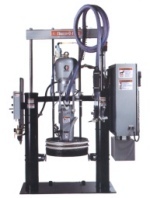 Graco’s Therm-O-Flow products are custom-designed to handle all of your hot melt applications. Kirkco will help you select the specific air motor, platen, heat zone controls, hose/gun kits and accessories you need for your specific application. The material type and usage rate determine the ideal pumping unit needed to complete your system. The air motor delivers the required power ratio of fluid pressure out to air pressure in. Depending on the application, choose either a 19:1 Senator®, 31:1 Bulldog® or 65:1 King® air motor. Kirkco will help you choose options to build the system best suited to meet your individual needs. Contact us today for a Hot Melt Configurator Form (#684052) or consult with one of our Sealant and Adhesive Equipment specialists for more information. Feeding automatic and robotic applicators directly from fiber or steel drum (extruding, streaming, coating). Dispensing heated sealants and adhesives to one or more manual operator dispensing stations(sealing, product assembly). The material type and usage rate determine the ideal pump for the complete system. The air motor delivers the required power ratio of fluid pressure out to air pressure in. Depending on the application, you will need either a 19:1 Senator, 31:1 Bulldog or 65:1 King air motor. Each of these motors is also available with a Quiet Air Motor option. The 19:1 Senator is used with materials that have the following requirements: relatively low viscosities of up to 50,000 cps, low flow rates of up to 5 lbs (2.3 kg) per minute, short hose lengths of up to 15 ft. (4.5 m) and fluid pressures of up to 1500 psi (103 bar; 10.3 MPa). The 31:1 Bulldog is ideal for materials that have a low- to medium- viscosity of up to 200,000 cps, medium flow rates between 5-10 lbs (2.3 to 4.5 kg) per minute, hose lengths of up to 25 ft. (7.6 m) and fluid pressures of up to 2500 psi (172 bar; 17.2 MPa). The 65:1 King is used with materials that have a medium- to high-viscosity of up to 2 M cps, high flow rates at a minimum of 8 lbs (3.6 kg) per minute and long hose lengths of 20 ft. (6 m) and more. This motor is best when fluid pressures of up to 4000 psi (276 bar; 27.6 MPa) are required. The application’s flow rates and the material used are the main considerations for selecting the heated platen. The heated platen is available in three styles: the standard fin design, the MegaFlo™ plate and the smooth bottom plate. The standard fin design is recommended for normal flow rates and for warm and hot-melt materials. For most applications, the MegaFlo plate (US Patent No. 6,076,705) is the plate of choice. The MegaFlo plate increases the heat transfer of warm- and hot-melt materials and allows higher flow rates of the melted material. The convex design of the plate reduces the amount of material left on the bottom of the container. This plate is also preferred for low flow rates when heat history or charring of the material is a concern. The smooth bottom plate is designed for use with materials that need to be cleaned often or don’t need to be melted before pumping. This plate delivers low melt rates when used with hot-melt materials, but may also be suitable for warm melt materials. The heated platen style and the material used are the main considerations for selecting the drum ram style. Therm-O-Flow Plus is available with either a pneumatic ram or a hydraulic ram assembly. Both are mounted on 6.5 in. (165 mm) cylinders. The pneumatic ram is the standard assembly for Therm-O-Flow Plus units outfitted with the MegaFlo platen. This ram is compatible with most hot- and warm-melt materials. The hydraulic ram is the ideal choice for applications that use high-viscosity materials requiring higher flow rates. This ram has a higher downward force on the material than the pneumatic ram. The increased feed pressure in the drum allows some materials to be pumped at a higher flow rate. The added ram pressure is especially useful for materials which are high viscosity, but don’t need to completely liquefy before being pumped. Choose the heat control that uses the voltage compatible with the power available at the installation site. The Therm-O-Flow Plus can be ordered with six or eight heat zones. Zones 1 and 2 are always used for the heated drum platen and the heated pump. Zones 3 and 4, 5 and 6, and optional zones 7 and 8, are available as paired zones through a 16-pin connector. The heated hoses have a 16-pin connector on the inlet end cable and an 8-pin connector on the outlet end cable. All heated valves, manifolds and heaters are equipped with an 8-pin matching connector. Accessory cables are available for other possible combinations. A communication pendant that plugs into the main control box can be set to turn on (preheat) and turn off at specific times for each day of the week. The pendant also allows you to easily set parameters for all heat zones including the set point, alarms, PID values and individual zone on/off control. An adjustable limit switch is mounted to the drum ram. The switch lights a warning beacon mounted over the unit when the drum level gets low. Contact terminals are also available in the control box for user interface. A proximity switch is mounted on the pump to sense movement. A timer is included in the control box. If the unit hasn’t been used in the pre-set period of time, the heating circuits will automatically turn off. This option is a steel shell that clamps around the outside of fiber drums reinforcing the drums for use on the drum ram. These are swivel-type drum clamps that enter the drum when it is slid into place. This option also assists in drum hold-down with chimed drums. Dual Unloader Crossover Control automatically switches operation of one pump to a second pump. Includes low level switches, lights and control for preheat and automatic drum changeover; 230 volt AC. Do not order Pendant or Low Level Kit when choosing auto crossover control. They are included with this option. Teflon® is a registered trademark of Du Pont. Therm-O-Flow Plus machines and complete configured packages carry the CE mark. * Includes drum melt grid, pump and a 5KVa transformer for the 230 volt hoses and accessories.